What’s the latest news about brown marmorated stink bugs? Veggie gardeners especially will be interested in two questions: How do you manage them in the garden? 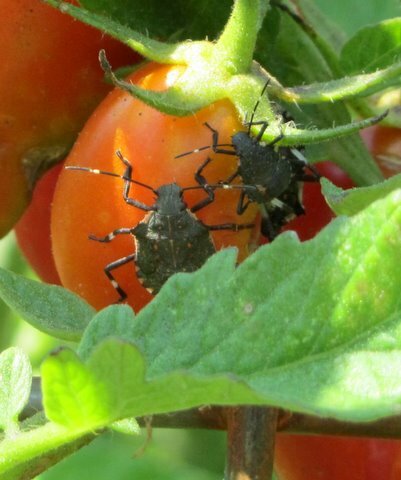 What insecticides control the stink bugs? You should read the FAQ to learn the answers, but be forewarned: There’s no silver bullet yet that will solve the stink bug problem. If you want in-depth information, investigate the link at the bottom of the FAQ. One I found particularly valuable: “Brown Marmorated Stink Bug Information Page—Northeastern IPM Center.” At the bottom of that page is “Stink Bug Presentations from ESA Eastern Branch Meeting, March 2011,” which gives an idea of the intensive research being done on the stink bug problem. If you’re ready to link to the HGIC’s “Brown Marmorated Stink Bug FAQ,” CLICK HERE. We as individuals can do our part….kill the little aliens whenever you see one Cheap and Easy!! Get a squirt bottle or squirt gun put Isopropyl alcohol in it and everyone you see slam 'em with a few squirts and within minutes they are dead and the best part NO Smell!! Thanks for the tip, Anonymous. You squirt isopropyl on the stink bugs and we drop them in soapy water. The end is the same, but, true, our bottles tend to smell pretty awful when we open them.